Something stirs in the land of Vesh - something unwholesome. In recent times, a relic of Mormo's destruction was brought to the care of the Vigils, but not without great sacrifice. The servants of the Hag Queen will stop at nothing to get it back - and the only thing that stands between them and the Serpent Amphora is your characters! Are they up to the challenge? 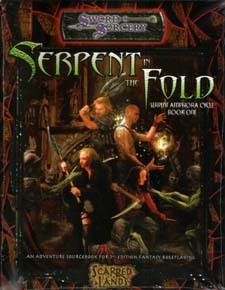 Usable alone or as part of the ongoing Serpent Amphora Cycle - which begins weith "The Serpent Amphora," a free adventure available for download at www.swordsorcery.com - Serpent in the Fold is an adventure for characers of 3rd-4th level. Requires the use fo the Dungeons & Dragons Player's Handbook, Third Edition.